Round 3 of playtesting for Atomic Robo: The Roleplaying Game is now closed, which means no new playtesters will be... what's the word... accepted? Required? You get what I'm saying. We have a lot of playtesters, but I don't anticipate any further significant changes -- changes large enough to warrant more full-scale playtesting -- to the rules as they currently exist. 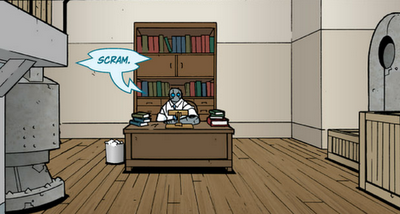 So... if you were like "I'm gonna get in on that Atomic Robo thing on Tuesday!" then allow me to offer my sincere apologies. Missed it by that much. If you're already a playtester, your feedback's still welcome, but now is the time to move into the next phase of things. That means turning what we have into something that looks like an actual manuscript, adding/adapting some more content from Fate Core, and generally getting everything in a state won't make the editor mad at me. In the absence of constantly updating you on playtest-type stuff, I plan to offer some genuine preview-type stuff along the lines of the character sheets I posted yesterday. Stay tuned! Sad I missed it. I really wanted to get in from the get-go, but just couldn't get people to commit. I'll just have to wait for the finished product like most people.